The Albion Motor Car Company (later Albion Motor Company) was founded in Bathgate, Glasgow, in 1899, and moved to a larger factory in Scotstoun in 1904. 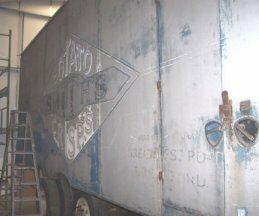 After 1918, it concentrated on commercial vehicles, and had a strong export market for products that had a reputation for robustness. 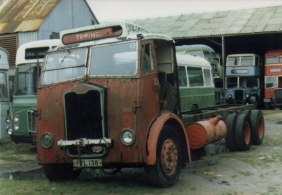 The Company was taken over by Leyland Motor in 1951, the year that the HD range of lorries was introduced. 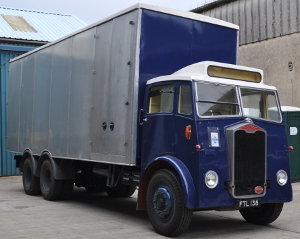 This vehicle was originally operated by Smiths Crisps as an open platform wagon, with Albions own 6-cylinder diesel engine. 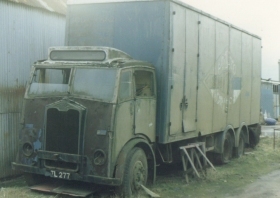 Sister vehicle FTL 277, having subsequently been re-built with a box van body, was withdrawn by the early sixties, and then used by an associate company as a storage shed. It passed to the Museum in the early eighties but was mechanically incomplete. 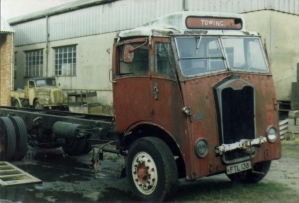 In the late eighties the Society were fortunate in locating FTL 138 in Devon, which had been used as a recovery vehicle. The decision was made to restore FTL 138, originally intended as a source of spares, with the box body from FTL 277, to the once familiar dark blue livery complete with gold leaf diamond trademark. The chassis of FTL 277 has subsequently passed to a private preservationist for restoration. 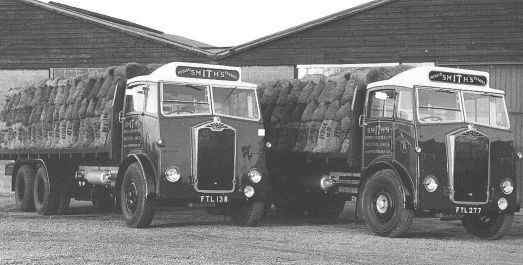 The Albion Trust have kindly supplied this photograph of FTL 138 and FTL 277 side by side when new as platform lorries for Smiths Crisps. 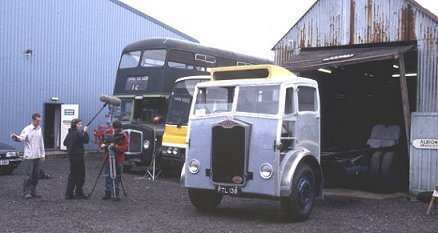 Apart from the two lorries in the photograph, only one other HD55 is known to exist. June 1999 - April saw the vehicle fire up, but after some running it was realised that the head would have to come off to check the gaskets. Luckily new ones have been sourced and should be ready to be picked up shortly. The radiator is now back in place after being stripped, refurbished and fitted with new rubbers. October 1999 - Derek has been wiring up the chassis and even though he has been laid low for a couple of weeks with a knee operation he is still very eager to get the job finished shortly. Excellent news too is that we have been very recently offered professional help with the construction of the replacement cab coupled with a grant from Lincolnshire County Council for which we are very grateful. More news soon. December 1999 - By the end of November the new cab frame was well under way and in place and looking very real! The chassis was complete with wiring and a full set of tyres fitted after the wheels had been shot blasted and sprayed up. April 2000 - Reconstruction of this vehicle continues with the majority of the cab framework completed, including both doors. The front wings are away for new ones to be copied and it should not be too long before the cab roof is refitted. July 2000- Panelling has now commenced, starting with the back of the cab and roof areas, after the latter received more new wood and a cloth finish. October 2000 - More panels are now fitted to the cab, together with the windscreen and associated beading. The front wings are being manufactured and should be ready shortly. Also, we were recently asked by NMTV to take part in a new series called Former Glory to be shown on Discovery Channel early next year. 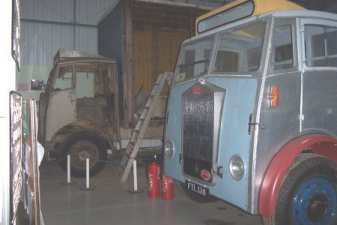 Albion and other commercial vehicles in our museum should feature heavily in this interesting series of yesteryear. January 2001 - The Albion was in the exhibition hall on our November 2001 Open Day showing that the cab was well on the way to completion with just the cab floors, glass and lining panels to go! April 2001 - Work is continuing on the cab rebuild which is now not far off being ready for painting. July 2001 - The cab is now complete  congrats to all. It really does look excellent. 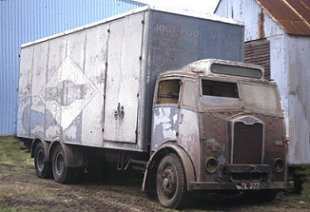 October 2001 - The lorry is now ready for work to commence on the bodywork (ex FTL 277) and this should start shortly. January 2002 - The rear of the body (still on FTL 277) has been stripped of panelling, as has the rear bulkhead. The rear doors and nearside doors have also been removed so that framing repairs/reframing can commence. New floor bearers at the rear of the body have just been fitted. New timber has been purchased and prepared in the Workshop (planed and cut). FTL 138 is now alongside derelict FTL 277 in the Museum, being moved there at the end of October, providing an excellent comparison of before and after! 138's chassis is also receiving a second coat of black gloss. April 2002 - · The nearside door frame woodwork and floor is now virtually complete. May 2002 - The nearside door frame woodwork and floor is now virtually complete. Pam has volunteered to prepare and repaint the interior woodwork. The door hinges have been prepared for shotblasting. The body is nearly ready for moving onto the chassis. The doors are being made soon and the back is nearly finished. The chassis still needs another coat of paint. October 2002 - Repairs to the nearside of the bodywork are now complete, and new aluminium panels are being fitted. January 2003 - Moulding has been attached over the wheel arches and the guttering done thereby completing work on the near side. Further work has been carried out on the cab prior to painting. April 2003 - Two lamps have been mounted on the Museum wall to cast more light on the body. The cab preparation has now been completed and this will be painted shortly. After an interesting morning repositioning the donor chassis (thanks all), the body work of the same has been stripped down on the off side and is in quite good order, although some new framing is going in as this is being written. The body roof panels need stripping of paint in situ soon. This photo shows the offside of the Albion before restoration work started. Clearly seen is the old Smiths Potato Crisps logo which we intend to replace on the restored vehicle. July 2003 - Work continues at an excellent pace reframing where necessary the offside of the box van body. Repairs to some of the body bearers were required. Also pillars around the offside doors and new floor boards. October 2003 - All the body frame repairs have been completed - with just the door frames to do - although there are six of them! New aluminium panels have been fitted now to the offside of the body, together with the steel plate which runs across the lower part of the rear of the body. The cab has been prepared for painting. 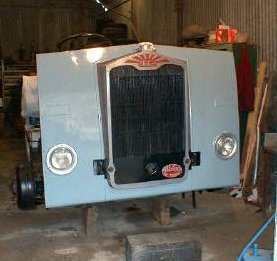 January 2004 - Work has now commenced on the door frames to the bodywork - there are six of them to tackle! We are now getting to the point when consideration will have to be given to the preparation of the restored chassis to take the box body. The chassis will need another coat of black gloss for instance. 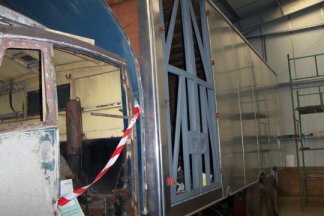 April 2004 - The restored chassis/cab has now been relocated in the Workshop for further chassis painting - its transfer from the back of the Exhibition Hall was not without a degree of frustration as although it was driven into that position it refused to drive out. Examination in the Workshop has shown a faulty delivery valve in the fuel pump and lift pump. Meanwhile work on the bodywork continues. July 2004 - The fuel pump was sent away for inspection (again!) and has now been overhauled and returned. Reconstruction of the body is nearly complete with the rear doors being reframed and hung on the body. It won't be long now before the transfer of the body to the restored chassis. That should be fun! October 2004 - This is now a goer again thanks to a fuel pump overhaul - and a lot of time to get things just right with the timing etc! The chassis has received another coat of black gloss. October 2005 - The restored chassis of 138 now has 277's body fitted to complete the restoration, after the body was cleaned off underneath and painted black. The exterior roof has been gently sandblasted to remove the corrosion, primed and painted white. April 2007 - Work progresses well with the interior of the body fitting many wooden slats to the framework. July 2007 - The body has been moved backwards a few feet so that the body front and cab back can be painted before the body is permanently fitted. January 2015 - The engine is now running well on the Albion, and work has been done on the air brakes, which seem to be in working order. A company has been found who can rub down, prime and paint the body and cabin dark blue and white for a reasonable sum, so hopefully this will take place in the spring. That just leaves the issue of either sign-writing the Smiths logos, or printing and applying vinyls. April 2015 - Outline agreement has been reached with a coach-painter to paint the box body, and with a local firm who can lowloader it to said painter. Efforts are now being made to establish the exact shade of blue to use instead of British Leyland Teal blue.